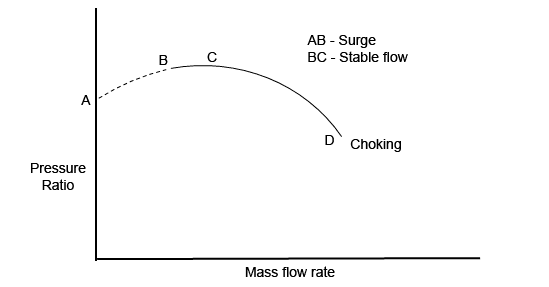 Figure shows mass flow rate vs pressure ratio of compressor. In AB small disturbance causes sudden drop in delivery pressure and result in violent pulsation in the flow. This Rapid oscillation is noisy, and if it continues it may damage the compressor system. It is known as the surge. The tendency to surge increases with the number of diffuser vanes. Surge causes the flow to separate and flow maybe reverse at some point. Surge is a complete breakdown of steady flow through the compressor. It is defined as the lower limit of stable operation of the compressor. The course of the surge is decreasing mass flow rate and increases a rotational speed of the impeller. It imposes stress on a bearing of compressor and motor and may damage it. Stalling is another instability in the flow of compressor occurs at nominally is stable operating range. The stall may lead to induce vibration, ultimately lead to fatigue failure of the component. It causes breakaway of the flow at suction side. Staling is less severe than a surge. In a stalling, flow rate oscillates at the localized region around the rotor. A rotating stall may develop into a surge. The choking occurs in the compressor which operates at a low discharge pressure and maximum flow rate. It is the limit of the performance curve, at this point velocity of the impeller reaches a velocity of sound of the gas at that condition within the compressor (Mach number reaches Unity). This point also is known as stonewalling of compressor. The gas flow rate and velocity cannot go beyond value at a choke point. It normally causes no damage in single stage compressor, but causes serious damage to the multistage compressor. Anti-choke valves are used to prevent shock when the flow increases to a certain value the anti-choke valve close and develops resistance to flow. Surge - Occur minimum flow rate, choking - at maximum flow rate. Stall - Localized fluid separation, Surge - complete fluid separation.